If you have not fished or experienced the outdoors in Western Washington, you might be wondering what do I need? This is a very common question. We supply all of the rods, reels, and tackle. We have all the top notch safety equipment. We even have some rain gear in case you forget, or the weather changes suddenly. But it is important that you bring some essentials, so you are comfortable throughout the day. We have detailed a list of minimum items to bring on your fishing trip. Some items may be an option, but fishing licenses are mandatory. You need to have the appropriate fishing license depending on what species you will be fishing. For example; if we are fishing the river, you want a fresh water license with a Salmon and Steelhead catch card. 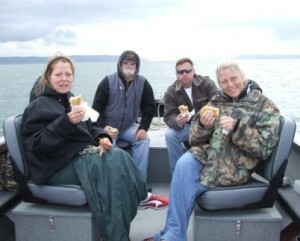 If we are fishing Puget Sound Sturgeon, you need a saltwater license. The weather in the Pacific Northwest can change quickly. Dressing properly is important to your comfort. You really should read this article about dressing properly. Buy your fishing license online at the Washington State Department of Fish and Wildlife. Weather appropriate clothing – Read more….. Kids Life Vest (PFD) Children are not required to wear life vest on our boats, due to the size. However, if you would like your little one to wear a life vest all day, you should bring your own. Our life vests are Type I Commercial life vests and kids can be very uncomfortable in our life vests. Most importantly, bring a positive attitude! Of all the items you will bring on your fishing trip, the must have items are a fishing license, water, and dressing for the weather. Even in our climate you can become dehydrated. Fishing for 7 – 8 hours without water is not good! Question: Can we bring some beer? Answer: Yes, you can drink alcohol while fishing with us. You must bring your own. If you become intoxicated to the point you are a safety hazard, that can end your trip. Not to mention, you have to get home somehow because driving is not an option. Do not bring illegal drugs. Ridge to River Outdoors & 365 Charters vessels and licensed captains are subject to boarding and inspection the United States Coast Guard, Fish & Game, and all local law enforcement. If you have prescription medication in a labeled prescription bottle, that is acceptable.